Cannabis plants being grown indoors. Growing cannabis is a combination of doing the right things, but also of avoiding the wrong things. Some mistakes can mess up your grow in a matter of a few days. They’re easily avoidable if you know what these mistakes are and the key here is to know what these mistakes are. That’s why in today’s post we will talk about the 3 biggest growing mistakes a beginning grower can make. Avoid these mistakes and your chances of successfully finishing your rise tenfold. Although growing cannabis is a combination of getting the right amount of light, nutrients, air and water, it’s probably light which has the most influence on your end-result. When growing outside, getting enough light is easy. Just put your plants in an open space which has access to at least 12 hours of direct sunlight, and you’re good to go. The sun never fails to provide enough light, plus never provides too much light. When it comes to growing indoors it’s a bit trickier because you’re using a grow light. And a grow light can fail to provide enough light, but also can provide too much light. A. Disregard the advertised coverage area. Grow light manufacturers generally, grossly overstate the coverage area of their lights. 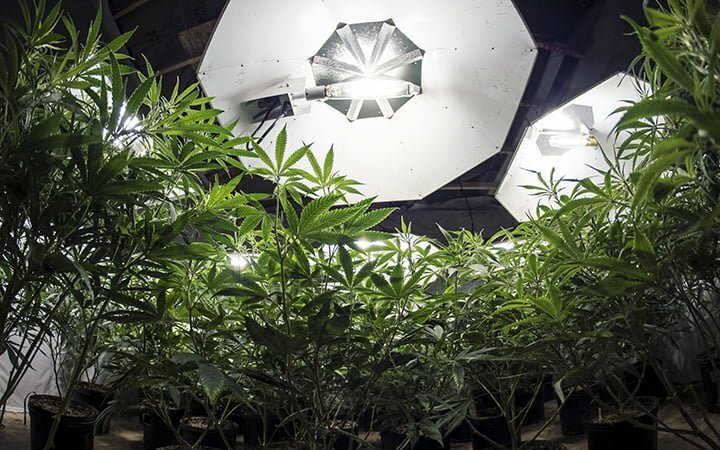 There are different ways you can make sure you get the right amount of light for your grow space. B. Use this light coverage guide. LED and HPS lights: 50 watts per square foot. CFL: 150 watts per square foot. There are more accurate ways, but these require information about the light’s intensity measurements, and these are not always provided! C. Avoid too much light. The easiest way is to start at the manufacturer’s advertised hanging height and make sure you can happily hold your hand where the plants are without it feeling too uncomfortable. Do always keep an eye out for light burn or bleaching though, and be ready to raise your light 2 or 3 inches until your plants stop burning and/or bleaching. This is probably the most common beginner mistake, because it’s so easy to think you’re doing the right thing, when in fact, you’re drowning the roots of your plants with too much water. Some beginning growers think the Cannabis plant is a very delicate plant which needs a constant supply of water to not dry out. Well, they couldn’t be further from the truth. The Cannabis plant thrives under a clear wet/dry cycle. This means you let your soil get completely dry before you start your next watering session. After the first 2 weeks, this is usually every 4-5 days. That’s about the frequency, but it’s also important to overwater in terms of quantity in a watering session. Water until your pots show the first signs of runoff. This is better than fixing a certain amount of water because how much you should water is also very dependent on the size of your pots. And if you fix a certain amount you still risk overwatering when you have small pots for example. When just starting out with growing, you want your plants to get the best treatment. So it only feels natural to feed your plants as much as possible. Because the more nutrients, the faster and bigger your plants will grow, right? This again, couldn’t be further from the truth. Yes, your plants need nutrients, but it’s very easy to overfeed your plants. It’s much easier to overfeed your plants than to underfeed your plants. Marijuana plants can still grow decently when underfed. But if you overfeed them, it can be mess up your crop in a matter of days. Cannabis plants are very sensitive to nutrients, so the devil is in the details here. All nutrient manufacturers have a recommended dosage. When you’re in the beginning stages of the vegetative stage, your best bet is to start out with 1/4th of the recommended dosage to see how your plants react and work your way from up there with small increments. For this, it’s also important that you understand what nutrient burn is and what it looks like, so you can actually recognize when you’re overfeeding your plants. Although it’s best to prevent any overfeeding, if it happens, you can try flushing your soil with water or a flushing agent like Clearex to flush out the excess nutrients. Depending on how quickly you recognized the signs of nutrient burn and acted on it, this is the only way to save a crop when it’s heavily overfed. You now know the 3 biggest mistakes that beginning growers make.